I'm ready to be warm again, lovelies. I know, I know - I live in Texas, for Heaven's sake. What do I have to complain about? The Northeast is getting snowed in for the zillionth time this Winter, Atlanta saw over a foot of snow, and to hear my friend in Maine tell it, her state is thinking of renaming themselves The North Pole. In Austin, we've had a solid month of gloomy, rainy low days in the low 50's. Puny as it might seem, it is still so cold. Normally I love chilly weather, but for some reason this year it's getting to me. Once the holidays ended, I was ready for Spring. I want to pull out the bright, sunny dresses, put on some espadrilles, and lounge around outside with a Mint Julep. Or, more honestly, a giant glass of iced tea. It's this impatient longing that's to blame what happened this weekend. You see, I bought fabric. Thirty-one yards of fabric, to be precise. It's not like I needed it, either. Don't go excusing it with "Oh, I bet she has a really small stash." or "Well, she will need something to make all those sunny dresses out of." My stash is not tiny, but my willpower is. Clicking around on Gorgeous Fabrics this weekend was like a shot of sunshine and Springy possibilities straight to the vein. There were florals and stripes and the same joyous colors I've been longing for. And I'm proud of it. Wouldn't you be? 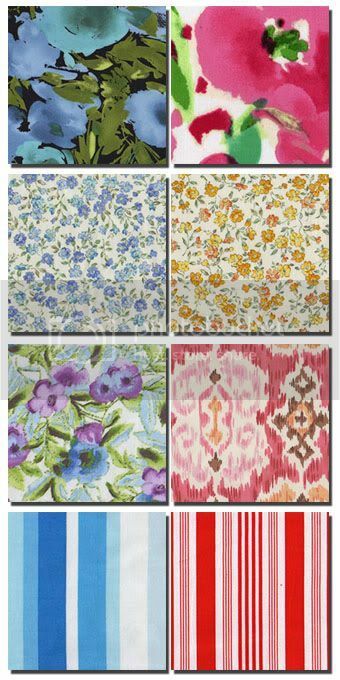 Check out these fabrics! Can't you just see the dresses and skirts clamoring to be made?